When it comes to buffets, though, operators can get tricked into thinking the guest should do all the work. After all, they're the ones walking up to the counters, typically serving themselves their desired portions. In these types of foodservice applications, luxury is often sterile and impersonal. In contrast, warmer and cozier service deliveries are often tied to lower key, more informal settings. But the reality is, a buffet service shouldn't rely on expected norms of what's pristine or what's comfortable. It should depend on interaction and engagement. "I believe the future of service will be based on informality," says Dominic Gorham, guest relation manager of The Thief, a modern, luxury hotel in Oslo, Norway. "It has to be more relaxed, more instantaneous, more of real life-contact with people." And when you think about it, that's exactly what a buffet service should be. Guests begin their experiences as soon as they walk through the door. From a sincere smile to the way the room is arranged, everything will contribute to those all-important first impressions. This leads to the question, does your buffet service encourage interaction? Creative displays can be challenging for a variety of reasons. Regardless, those hurdles must be overcome, while also creating new and interesting points-of-contact between staff and guests. Mobile serving carts can be a great option. Instead of relying on guests to join the party, operators can bring the party to the guests. Rolling buffet carts are a perfect way to welcome guests with a signature cocktail or some light hors d'oeuvres - and with a personal touch. Mobile tables are another option for encouraging guest interaction. They can be configured in ideal locations, serving as gathering spots for eating, drinking, and conversation. Because the carts are small and can fit just about anywhere, adding coffee tables or small high tops can space out the room, ensuring a more comfortable feel. 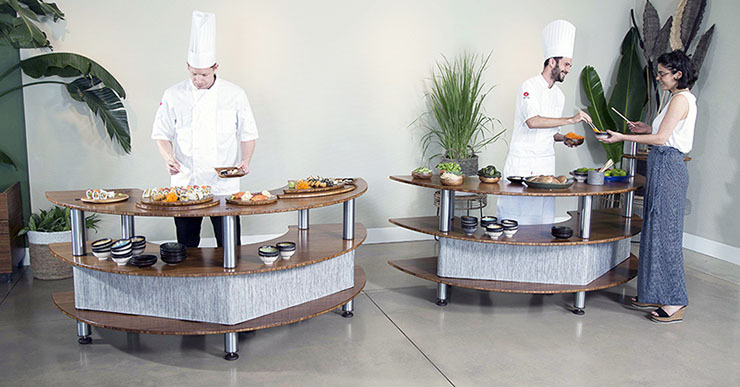 Finally, when utilizing serving stations and banquet food stations that include hot induction capabilities, operators can entertain guests with customized and entertaining foodservice options. With creative, interchangeable buffet serving configurations, lines can highlight these personal preparation stations to help raise the perception of the service making it more fashionable and luxurious. Building a stunning and memorable buffet experience can depend on a lot of different elements. Discover some easy ways to deliver this type of service by downloading our Tips to a Better Buffet. * This blog post was created with source material from Mogogo.